Good news for fight fans who’ve been on a rollercoaster ride all through the holidays as the on-again, off-again Manny Pacquiao–Floyd Mayweather superfight went from a done deal to no deal to a lawsuit and now, finally, mediation with the same Santa Monica based mediator who unsnarled the previous problems between Top Rank and Golden Boy over their claims on promotional rights to Pacquiao. The truth is, there is too much money on the table for this fight to not happen. It’s clear that what is needed is a sensible, face-saving way out for everyone. At the heart of the issue is the demand by the Mayweather camp that Pacquiao submit to random Olympic style bloodtesting with no limit on the number of times blood can be drawn and no cutoff date before the fight after which blood cannot be drawn. Pacquiao’s side has agreed to unlimited urine testing plus a blood test immediately after the fight, and one 30 days before the fight. Pacquiao is reluctant to have blood drawn closer to the fight and cites a situation in his second fight with Erik Morales in which he had blood drawn two days before the fight; felt weakened, and lost the fight. Pacman haters say the only reason he would balk at the tests is that he’s on something; Pacman fans say no, he just isn’t going to let Mayweather play mind games with hm and have him wondering if they’re going to come into his dressing room on fight night or at the weigh-in to take blood. Meanwhile Pacquiao has launched a lawsuit against Mayweather et al for defamation. So that’s the setup as the parties go into the mediation tomorrow in Santa Monica. The mediator, Daniel Weinstein, is a respected former judge who successfully mediated disputes a few years back between Golden Boy and Top Rank — so he would seem to have credibility with both sides. So what is possible via mediation? The main issue it would seem is — can there be random blood tests (Mayweather’s side wants this) but with a limit to the number of times blood can be drawn and a cutoff date for drawing blood that Manny’s side can live with. Manny has already agreed to a 30 day cutoff; and we know that Manny gave blood 24 days before the Hatton fight, so it would seem a reduction from 30 days to 24 days would not be a problem. Mayweather will want it to be 7 days max; so it seems reasonable that the two parties might agree on a 14 day cutoff. The other issue would be to agree upon a maximum number of times blood could be drawn during the period between 30 days before the fight, and the cutoff date. 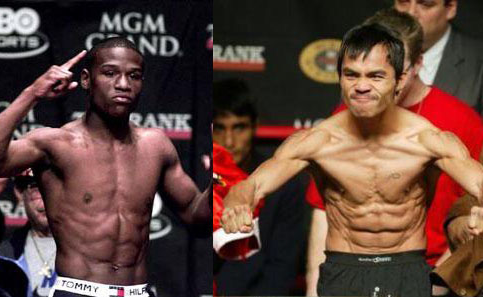 Mayweather may not want to set a limit; Pacquiao surely will. The other issue will be what becomes of Pacquiao’s lawsuit against the Mayweathers and Golden Boy. Will he drop it if the fight is made? Will he require an apology? If so it could be a problem because there are massive egos and minimal maturity involved here. Is there some formulation short of an actual apology that would satisfy Pacquiao and not cause the Mayweathers to lose too much face? The bottom line — it looks like both sides seriously want to get the fight made, as well they should, because another chance like this may not come along for decades. And there’s no guarantee that if they postpone now, they can put it back together in September or whenever. Judge Weinstein — get it done! Prediction: What Will Avatar's Monday Gross Be?